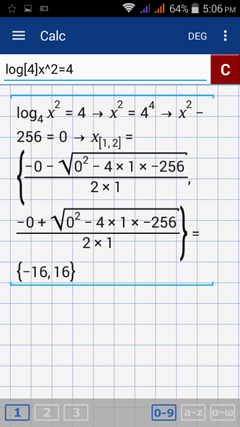 Enter logarithmic equations using the ln key and its functions (ln, log, log2) depending on the base and write the argument in parentheses. If the base is an arbitrary positive integer, write the base in brackets followed by its argument in parentheses. Enter one equation per workspace. 1) Enter the equation: 2log(2x + 5) = 2 with base 3. Enter the log by tapping ln twice and use brackets by tapping the parentheses keys twice. 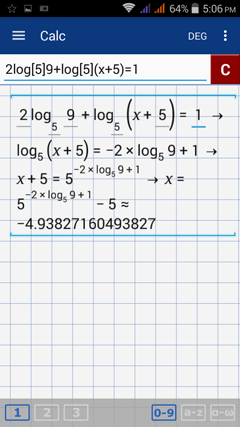 2) Enter the equation: 2log9 + log(x + 5) = 1 with base 5 logarithms. Enter the log by tapping ln twice and use brackets by tapping the parentheses keys twice. 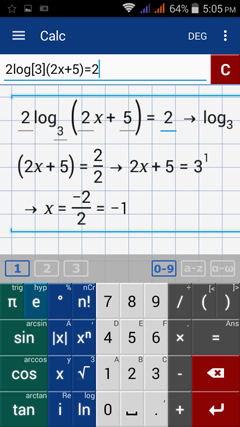 3) Enter the equation: logx^2 = 4 with base 4.​ Enter the log by tapping ln twice and use brackets by tapping the parentheses keys twice.